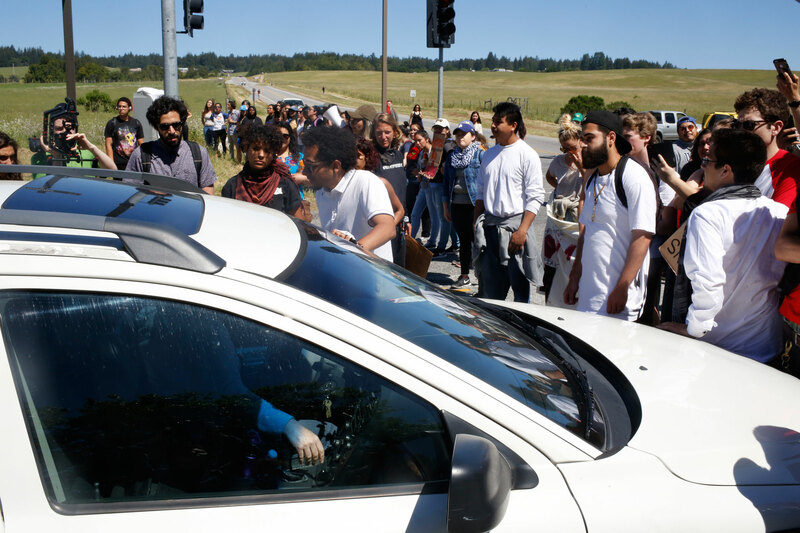 On May 1, the UC Santa Cruz March Collective shut down both campus entrances. Students linked arms at both entrances to block anyone from entering campus in observance of International Workers Day. Photo by Danielle Del Rosario. 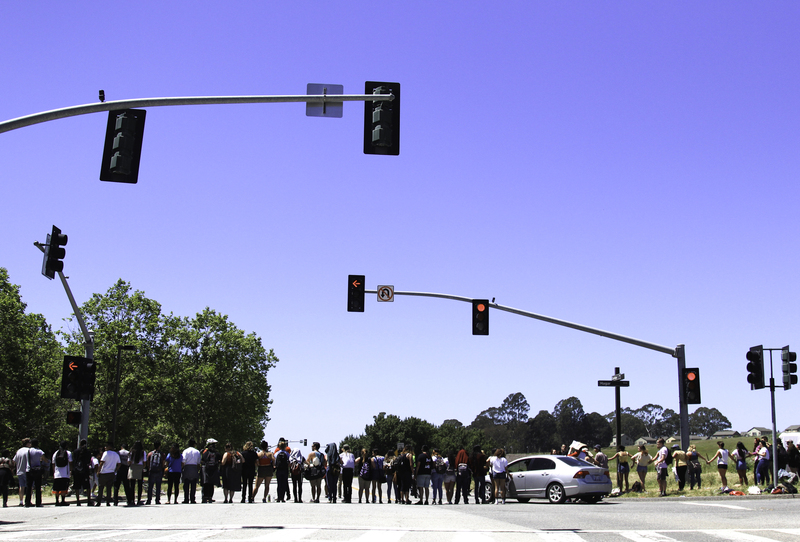 Hundreds joined protest lines at east and west UC Santa Cruz entrances Monday in a nearly 10-hour campus shutdown. Organized by UCSC March Collective, protesters shut down both campus entrances from about 6 a.m. to 4:30 p.m. on May 1 — International Workers’ Day. Many classes were canceled and dining halls were closed or had reduced hours because faculty and staff could not pass the protest lines. At around 4:30 p.m., protesters marched to Beach Flats to join city activities. The goal of the shutdown was to give underpaid campus workers a day off and increase awareness for the issues workers face. Throughout the day, protesters allowed emergency vehicles, press and health center staff onto campus but blocked all others who would “contribute economically to the university” from entering, said Benito Aguilera, March Collective organizer and fourth-year student. 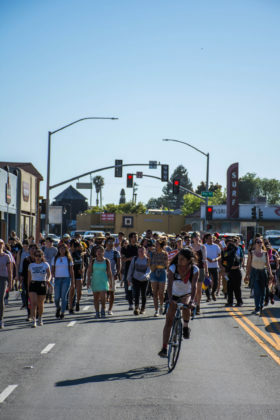 At 11 a.m. about 100 protesters linked arms across the intersection of Hagar and Coolidge refusing to allow anyone — including pedestrians — through. Some jumped the nearby fence to get onto campus but were met with discouraging shouts from protesters. The students’ intent behind the protest lies in the history of May Day, a day celebrated worldwide to raise awareness and support for workers’ rights. 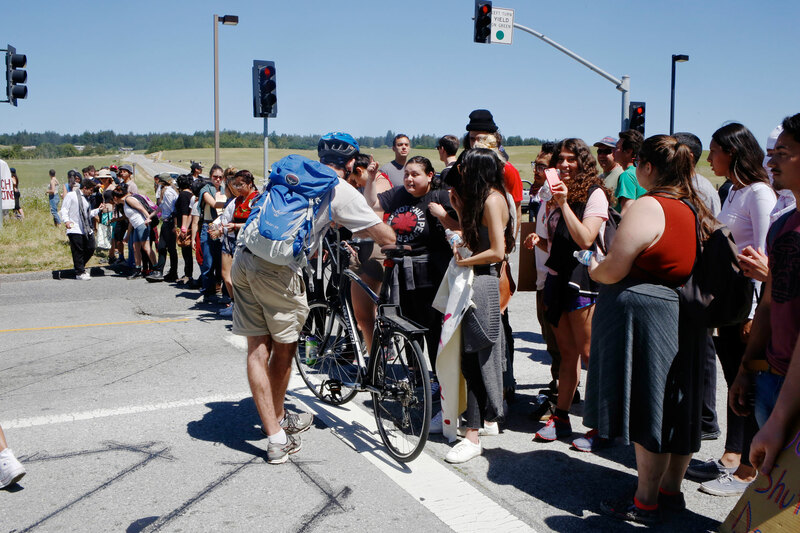 This year, UCSC students and Santa Cruz community members closed campus to protest insufficient pay of the university’s lowest-paid workers. According to a statement from the March Collective, a UCSC dining hall cook makes an hourly wage of $17.88 and a Senior Custodian makes $19.57 while the hourly wage needed to support one adult and one child in Santa Cruz is $28.41. Throughout the day there were confrontations between the protesters and cars, bikes, motorcycles and pedestrians trying to rush the picket line, but most were unsuccessful. Numerous conflicts broke out on the picket line, leaving one with a broken nose and others with minor injuries. UCSC PD responded to deliver first aid treatments to those affected. Throughout the day, emergency services were called to medical incidents on campus, including a suicidal individual, who was placed on a 5150 hold. 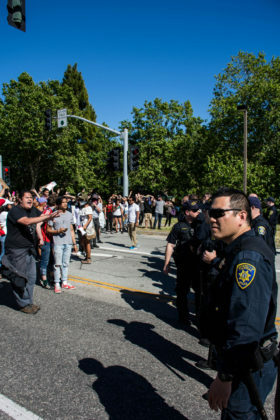 Emergency vehicles and UCSC PD were delayed in locating and responding to some of these individuals because of the protest, said UCSC Police Chief Nader Oweis. 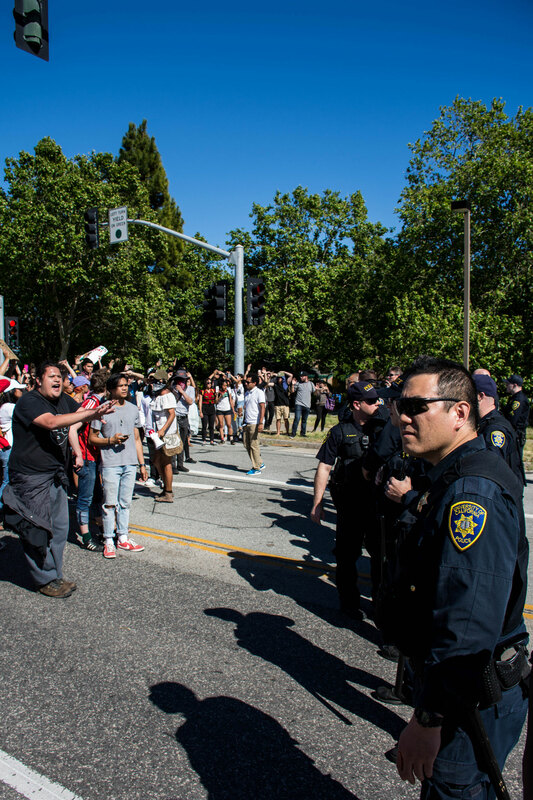 There were about 30 officers representing UC police departments from both UCSC and UC San Francisco present at the protest, Oweis said. Three arrests were made on the protest lines, all were misdemeanors. Of the three arrests, two were students — Athena Del Rosario, 34 and Sophie Blake, 21. Del Rosario was arrested for delaying or obstructing a police officer and booked into the Santa Cruz county jail and Sophie Blake was arrested on a charge of assaulting a police officer — she was released and not booked. The other arrest was Bradley Snyder, 46, who was arrested on a charge of fighting in a public place. Custodial workers trying to get on campus were told to come to work by their supervisors and upon not being able to enter campus, were told to wait at the base until the picket line opened up. Knowing this, protesters decided to keep the picket line going until the end of the workers’ shift at 4:30 p.m. rather than marching downtown at 1 p.m. as tentatively planned. “We’re happy to see students organize and unite for a big cause like today and we support [students] 100 percent. We’re with [them] even though we can’t be at the line right now,” said Nick Gutierrez, a custodian for College Nine dorms and American Federation of State, County and Municipal Employees (AFSCME) 3299 Union member. 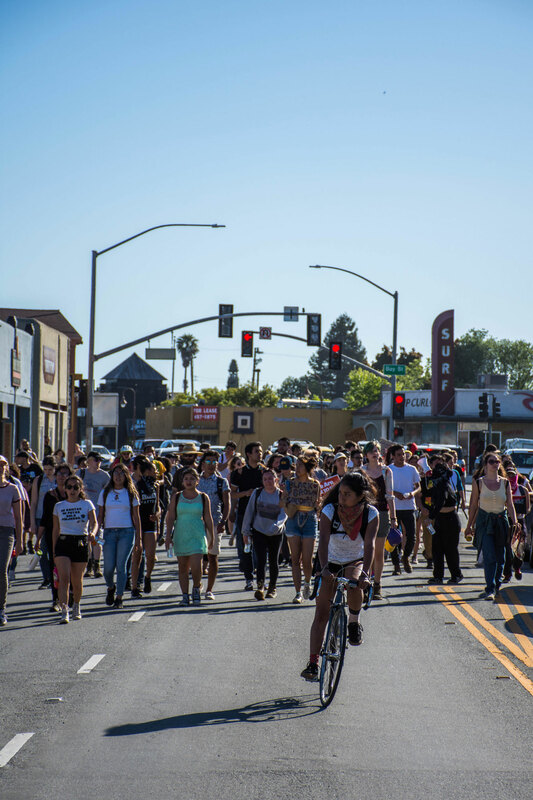 At 4:30 p.m. student protesters from both entrances to campus joined and marched to Beach Flats to join in city May Day Activities. Additional reporting by City on a Hill Press Staff members.